Synopsis: “In the new suspense thriller GONE, Jill Parrish (Amanda Seyfried) comes home from a night shift to discover her sister Molly has been abducted. Jill, who had escaped from a kidnapper a year before, is convinced that the same serial killer has come back for her sister. Afraid that Molly will be dead by sundown, Jill embarks on a heart-pounding chase to find the killer, expose his secrets and save her sister” (Gala Entertainment Sdn Bhd). Verdict: This is a movie that only paranoid girls can relate to and probably still say that it’s lame after watching. Gone lacks of originality and substantial engagement. It’s slow paced with a horrible script that’s unpredictably predictable. It manages to build up a little bit of suspense towards the climax but finishes disappointingly without any attempt of a twist at all. There are already a number of similar films that are way more interesting than this one. 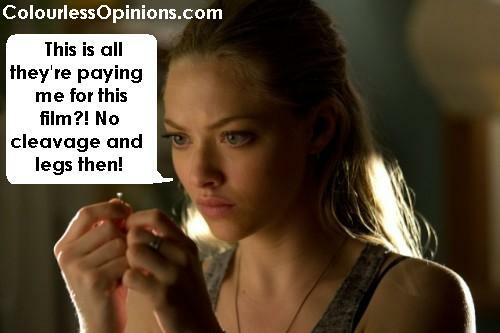 Furthermore, Amanda Seyfried reveals no skin on the film so there’s even lesser reasons to waste time on this rubbish. Second opinion: “Boring, was hoping for something at the end” (Iris Loong). Incompetent police & antagonists: In this movie, the cops are assholes who don’t listen or care and they can’t even chase a junk vehicle that protagonist (Amanda Seyfried) borrowed. The antagonist (Socratis Otto) lures the girl to his lair and still loses to her, for the second time (he got beat up first time too). He’s somehow very good at covering up his tracks though. He was severely injured when the protagonist escaped from him but managed to close up the hole and clear out all the bones and evidences of the past victims (seriously, not even a non-injured athlete could’ve clear all that up that quickly). Either that or the police really was incompetent. The purpose of the antagonist? So the protagonist was kidnap, placed deep into a hole to the ground and had dog food served for her although her limbs and mouth were all plastered up. She was not physically harmed or sexually abused. Other victims were killed with their bones buried underneath. No explanation to why the kidnapper does it or what he did to the other victims. Totally unfunny scene: “She just said yes to Sunday. The next thing you hear is me brushing my teeth,” says Molly (Emily Wickersham) to the phone before turning on the electronic toothbrush to clean her teeth. Special thanks to Sharon Gan and Gala Entertainment for the invitation to the press screening.